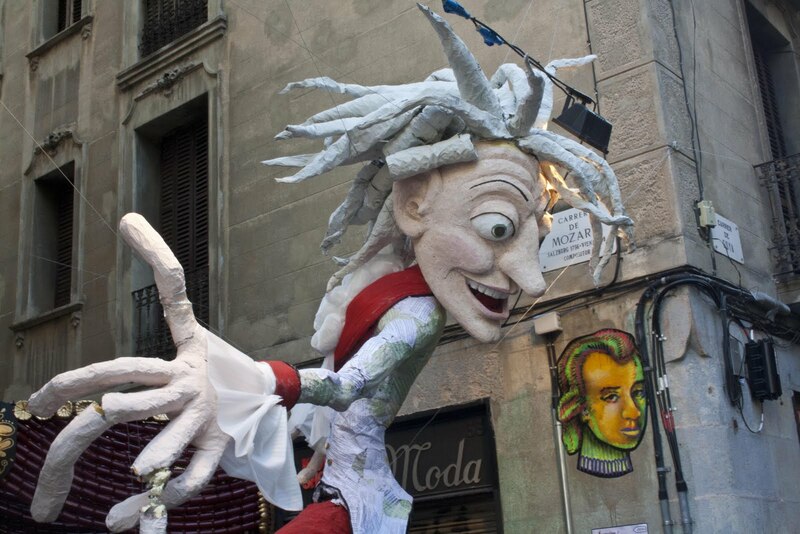 This past week has been the Festa Major of Gràcia, one of the most important neighbourhood festivals in Catalonia. The Gràcia district lies directly north west along the main central axis of Barcelona, leading from the port up La Rambla and towards the Collserola hills at the back of the city. The area was an independent town until 1897 when the great expansion “eixample” engulfed the area into the growing city. The festival is celebrated every year around the 15th August, day of the religious festival The Ascension. 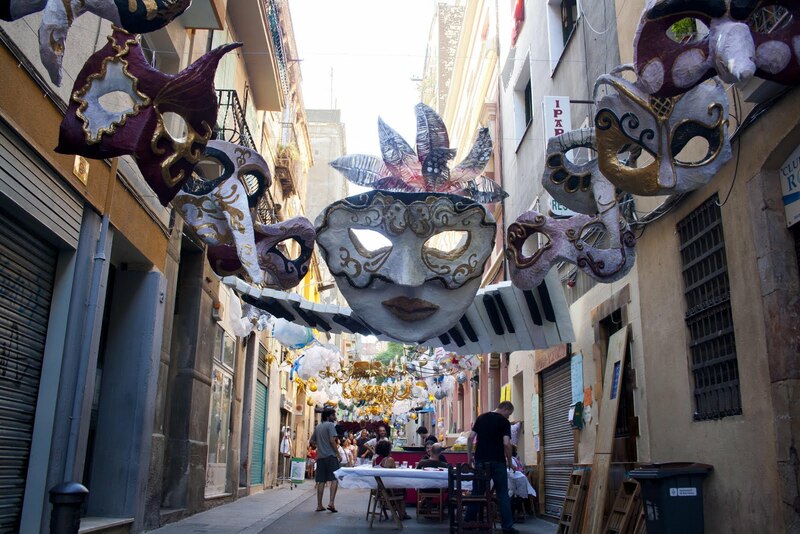 During the festival, the district is portioned into neighbourhood zones who each block off a part of one key street with a stage and a little bar and then decorate the area with an elaborate entrance and a temporary ceiling of lights and whatever comes to mind. Bands play music on the stage, varying from the traditional Catalan Sardana dance, to reggae, rock, funk, salsa and jazz. The best decoration, all made using recyclable and recycled material, is given a prize, while they neighbours come together to eat collectively and enjoy the shows. 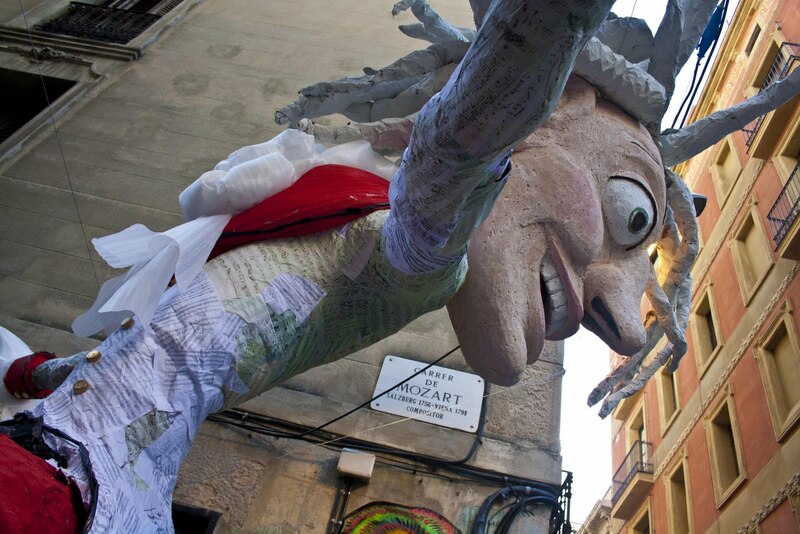 One of the highlights of this year’s festival from a decorative point of view was the street Carrer Mozart leading from the square Plaça Villa de Gracia. The entrance featured a gigantic and insane looking Mozart, somehow reminiscent of the giant puppet used in the recent Serge Gainsbourg film. In a lovely touch of detail, his body was decorated with pages of sheet music, while behind him in the street hung many papier mâché figures, masks and painted CDs. My father often hangs CDs from fruit trees to scare away the birds, something one can never imagine doing in the late 80s when they first made their presence felt on the market. 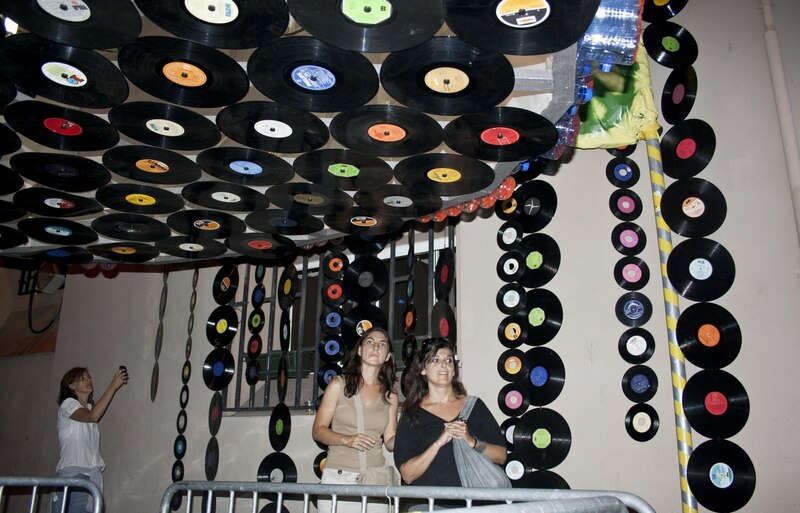 As if not to be outdone, the stage at Carrer Siracusa had gone all out, hanging a glut of vinyl records from the buildings and wires above the street, amongst them copies of Mike Oldfields “Tubular bells” as well as many different Catalan and Spanish 7” discs. No MP3s will ever hang here, but you have to wonder if symbolically this somehow represents something of the digital age? One of the key events of the festival and an important part of Catalan identity is the sport of Castellers or Human Castles, which is performed by different suburban clubs on different occasions throughout the year, with an annual competition. As well as strength and unity (thereby perhaps, forming a symbol of Catalan identity politics in Castellers), successful castle building also requires music. As the Castellers climb over one another to reach the maximum height, a small group of musicians accompanies the erection with medieval flutes and drumming. The music is not merely incidental, but serves as a form of communication from the technical crew on the ground to the castellers who cannot look up or down to see how the castle is forming, but who must rely on cues from the music to know when the child reaches the pinnacle. Indeed, the public is often requested to remain relatively quiet during the construction to enable the castellers to better hear the music and thus communicate with their colleagues. Check for the castle beginning around the 1:30 mark. The music begins once a certain stability of the base structure has been achieved and when the lower levels become “blind”. Note the change in music when the child reaches the summit, then the music resumes until the base is disassembled. For each type of castle the music is the same. Except for crowd noise and the growing energy of an anxious or excited public, one wonders why similar musical measures are not used in other sports? People often talk about rhythm and tiempo in football matches, for example, but nobody has ever tried beating on a drum to try and rhythmically pace a match, for example, much like galley slaves would use the beat to set their oars in rhythm.